﻿ The Shore at Katathani - Adults only, Phuket | FROM $365 - SAVE ON AGODA! "The staff wore big smiles." Have a question for The Shore at Katathani - Adults only? "Gorgeous Hotel with breathtaking view, perfect for couples and group of friends." "Staffs are friendly and very helpful." "Breakfast (which can get boring) changed daily and really good coffee was appreciated!" "We loved the private pool and the parents retreat upstairs w..."
For impeccable service and an indulgent getaway, look no further than the Shore at Katathani-Adults Only. The rooms at this property have ocean and pool views, so you can look out at an unforgettable scenery. This property is near Kata Noi Beach, Kata View Point, Nui Beach, Kata Beach, and M.G.Collection. With tours available, it is the perfect place to stay to learn about the area. Massages are available, so if you want to spend the day relaxing and unwinding, you can easily do so. With safety deposit boxes, an infirmary, a salon, a convenience store, as well as a laundromat, the Shore at Katathani-Adults Only has several convenient features to make your stay more comfortable. This property offers a range of facilities for guests to make use of throughout their stay, such as a fitness center, a sauna, ticket services, a garden, and a spa. It features a kids club, giving your little ones a secure place to play and have fun. Whether it's a bar or restaurants on-site, it has a variety of dining and snacking options. There's free Wi-Fi available in all rooms, as well as Wi-Fi in common areas, so visitors won't have to worry about purchasing a local sim card. The Shore at Katathani-Adults Only has air conditioning, a CD or DVD player, a refrigerator, and free bottled water, as well as satellite or cable channels, bathrobes, a hair dryer, a seating area, and more. The front desk is open at all hours, so there will always be a member of staff on call to assist you. English, German, Russian, Mandarin, Italian, and other languages are spoken at this location. This property is pet-friendly, so you can keep your dog at your side throughout your vacation. The Shore at Katathani-Adults Only provides express, private, and 24-hour check in and check out, enabling you to conveniently use the option that best suits your schedule. This property has a variety of transport options which include airport transfers, shuttle services, and car rentals. Phuket Bus Terminal 2 is 16.5 km away. The nearest airports are Phuket International Airport (HKT) and Krabi International Airport (KBV), which are located 33.7 km and 81.6 km away. "This resort has wonderful beach and nice private pool." Minimum age of guests is: 13 year(s). The room with a sea view was breath taking, I didn’t want to leave. The staff were fantastic and had a great sense of joy. Room was the best. Food good but we mainly ate out. The only downside is I wish it had a bar outside in the evening for drinks. Otherwise the best. Stayed 2 nights at the seaview pool villa and was amazed with the view. 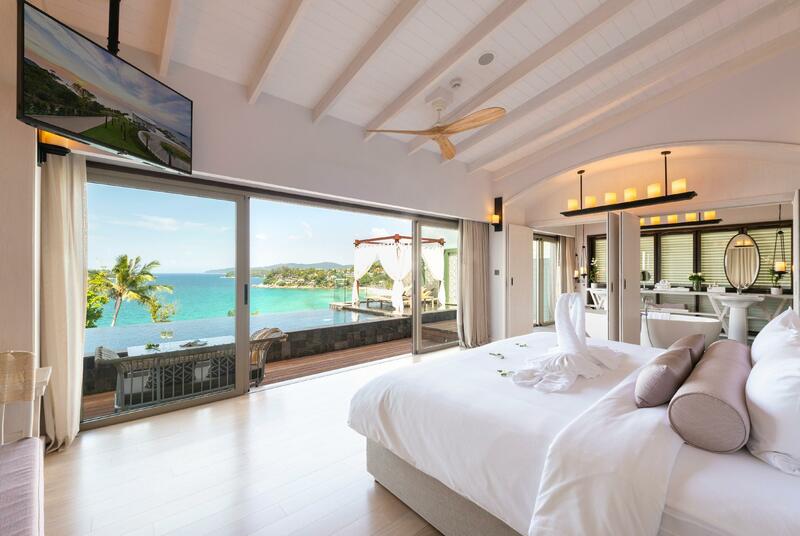 Waking up to an ocean view. Staff was very professional and friendly! Kudos to K.Chutima & the team for helping me with the proposal. Had a wonderful stay! I booked an premium villa at the shore, this room does not exist at the hotel yet Agoda charged me much more for something I did not get! They have all these nice room classes on their website but it does not exist. Use another travel agent rather!! From the moment we arrived this hotel exceeded our expectations. The room was amazing (sea view pool villa romance) although the first one they put us in had a tree right in front of the private pool, they moved us the next day to the best room in the hotel (8866 - request this room if you can), where we watched the stunning sunsets for the remainder of our stay. Food was amazing but not cheap. Staff were amazing, they ferried is around on golf carts all day everyday because those roads to the rooms are complicated and have some steep hills! Even the beach section at Kata Noi is the best bit of beach around Phuket, clean with no stones and far reaching shallows! This is a high end Maldives level hotel and only 20mins in a taxi to the hustle and bustle of Patong. Great hotel, our private pool had warm water and the entire complex was nice and quiet. The staff was wonderful and we never had to wait for a buggy up or down the hill. Breakfast was good and the welcome cocktail party with delicious food, complimentary wine and live music was fantastic. The only room for improvement would be higher quality sheets they were a little rough and the health club needs to have more air conditioning and the waters were all empty so it could be better attended to. We would definitely return to this hotel. They also do a shuttle to Patong Beach for only 150 Baht each round trip that leaves at 8:30 pm and returns at 11:30 pm. We loved seeing the nightlife in Patong but staying on nice Kata Beach. You can also have your laundry done in the little stores right outside the hotel for only 80 Baht/KG. Ta Restaurant in town was good and Mama Tri’s for fine dining was good not great. No reason to go there for dinner when the views are just as good from The Shore. Good services and good management from the Resort manager. Staffs were always ready to greet with a smile. Everything was beautiful beyond words. We stayed for 2 nights on early November 2018. We got the room with stunning view; 8867, the room decoration were really sweet. Foods and Afternoon tea were very good. But we would be a little complaint, we found a part of tile in the pool it might be happened because the room just finished from a construction that the hotel should be aware. We hope your hotel can have better checkup regarding this. however we appreciated for the hotel's effort for pay attention in any cases. Overall The Shore makes the whole trip never the same again. We really love this place. It's a fantastic experience, hope to be back soon. Stayed at The Shore at Katathani for a weekend getaway and felt that it was way too short! The room was very well organized, clean and had an amazing view of the ocean. Our favourite part of the weekend was just soaking in the private pool and gazing at the ocean view. Service was also fantastic with the staff looking after our every need. Room service was reasonably priced and tasted great too. Was a bit of a splurge but worth it for a special occasion. We stayed here for 4 nights. Loved the pool area and views. Seaview Pool Villas are really amazing! The staff was very good and very supportive. Housekeeping staff, the buggy drivers, Noah - thank you :) Resort manager was always prompt in ensuring that I and my twin felt comfortable. Great memorable stay! I have been traveling to Phuket several times this year and have stayed at many different places on the island mainly beachfront resorts.... I have to say this is the best one yet. First off this hotel is on the Kata noi beach which is the smaller and more quite of the two Kata beaches. It is apart of a grand katathani complex which makes it nice because you have access to more then 7 or 8 restaurants that you can go to that are apart of katathani and you can have them just charge what ever to your room. Their part i the beach is at the end and is very quiet and even near some rocks were you can snorkel and see some fish. The main highlight of this place is the room, we stayed in a two bedroom villa and it was stunning, from the personal pool to watching the sunset it was really nice. When we get the chance we will be back and probably only stay at The shore from now on. Awesome hotel! When we checked in, the lobby is so stylish that have great coaches and smelled flourish! And we had welcome drinks, snacks and beautiful flowers! They have golf car that could drive you around. Also we got free upgrade to a sea view villa! What a dream that could wake up with a infinite pool and beautiful beautiful sea! Nice breakfast buffet and have lots of variety. They served free drinks, including champagne during breakfast and the complimentary afternoon tea! So so many awesome details, already cannot wait to go back! We were at the Shore for vacation but treated like honeymooners! It was unexpectedly great. The individual units gave us privacy that we need. Our room has an amazing view of the beach which gave us the much needed vacation vibe. The private near the Rock was amazing, cleaned and clear water. The facility, the pool, dining, and even the path to our room was nicely done. Staff were friendly helpful and always smiling. It was pricey but it was worth the price for sure. (1) If hotel can provide some fruits and put on the room, it will be wonderful. (2) Every day I ate breakfast inside the pool villa, but the food choice is not enough. (3) This is my honeymoon trip with wife, we are surprised when we check in, the room decoration is very pretty. And when we check out, the hotel gave us a photo for our good memories, thank you very much! I stayed in pool villa sea view. If you have the budget, this would be the best hotel to stay in terms of view, private pool, access to beach, and friendly staff. The only downside would be the price, which is equivalent to the 5 stars hotels in Maldives. Location is closer to kata beach if you are looking for activities, but 30 mins by taxi to the crowded Patong Beach. You can get breakfast served in the room if you pre-fill the forms the night before. The private infinity pool was larger than I expected, you can even swim a little in it, and there is a sundeck and living area in the balcony too with full privacy. I will definitely want to stay here again if I were to return to Phuket. But do be careful of some sharp edges in the pool. Thanks for reserving the best sea front villa for our anniversary trip. The welcoming fruit, dessert & room decoration were really sweet. My husband and I were surprised! The sea view is absolutely breathtaking. Together with the private infinite pool. Such a great relaxation! All the staff are helpful & friendly. Room services is outstanding. We got a lot of tasty choices for breakfast. No matter poolsided or seasided breakfast, it is just great. Although the airport pickup service was a bit late, we appreciated for the hotel's effort for rapid coordination. Last but not least, one of the light bulb failed in our room. We hope your hotel can have a better checkup & maintainence regarding this. Overall speaking, The Shore will still be our choice for our next anniversary trip. Before we went for the trip we'd have browsed through almost every single resorts and villas on agoda. We came across a few that meet our high requirement: clean, great view with private pool and good value for money. The shore has always been on thé top of the list. I never regret for one second the moment we were greeted by the staff. Service is amazing, very attentive and very personal. We have stayed at other resorts before which we thought at that time was really good. This one is even better! We booked a seaview pool villa. It has a private pool that faces the ocean. The view is absolutely amazing. The room is very very clean, the washroom is very clean, spacious and very conveniently conncting the pool making the whole experi nice easy. Breakfast and afternoon tea are included. The only downside I can think of is that the food can be more local and the distance is a bit far from the airport. The beach is quite wavy so not quite suitable for swimming. Other than that, everything is as per other reviews. Absolutely the best holiday getaway! Highly recommended for anyone looking for a relaxed, carefree and 6-star holiday. We stayed in a 2BR pool villa duplex and it was stunning. You can see the panoramic view of Kata noi beach from both floor. The private infinity pool is gigantic compared to most 'pool villa' that I've been. The design, quality of material used and decoration may not be the best. The room was slightly tired, but it's still a fantastic property. Staffs are friendly and very helpful. F&B is okay but nothing special. Breakfast line in the main restaurant was small. (You might want to check out Katathani's restaurant instead). Complimentary tea set for every guest is nice, though. For the beach, I think Kata noi beach is the best beach on Phuket island. The fact that Katathani have several properties on the entire Kata noi beach makes it's more exclusive than other beaches in Phuket. (Note that according to local law, beach is a public property. It might not be as quiet as Mai Khao beach. But the quality of white powdered/ soft sand and view is the best. we book pool villa at the shore. It was very well decorated cleaned and face to the sea. Should try BF in the room, you will enjoy the moment. All staffs are very friendly and helpful. Most of them can speak English very well. Love it! 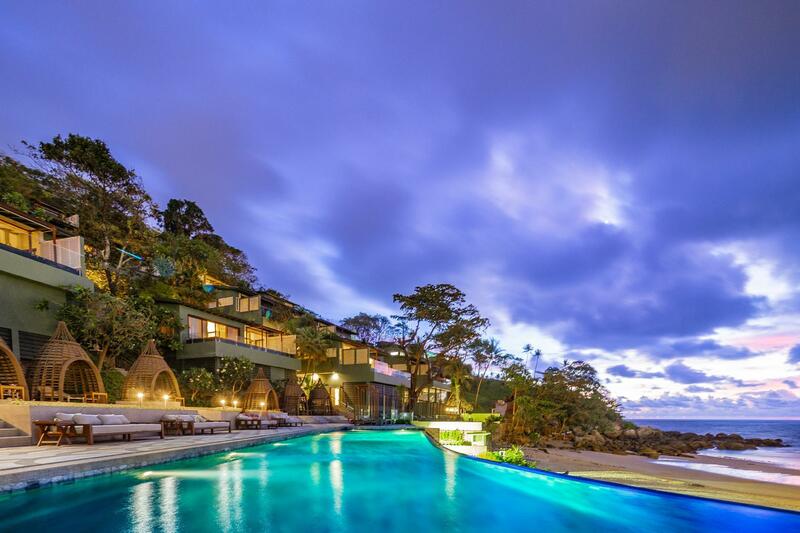 Amazing stay: Great villa's. Clean and high quality facilities, good aircon, proper WiFi (very rare on Phuket), attentive service, good breakfast buffet (not too much but the right things), great location (next to quiet kata noi beach but within 15min you are in Patong). The view was amazing! We have a private pool in our room and is facing the beautiful ocean. They have very fast internet connection too! The staff is friendly, the room is very clean and comfortable. Me and husband had a great stay at the hotel and would like to come again if we have the chance. We have booked a garden view pool villa and we were very dissapponted. These villas are on the back side in the mountain, and your terrace and plunge pool is in total shaddow, ending with a dark colour wall just 2 meters in the back. We thend ecided to spend the ectra money to change to a sea view villa, and from that moment we had the most incredible and unforgettable view down to Kata Noi beach. So, if you think you want t spend the price for this resort, then you should book the sea view villa without any compromise. The villas are very clean and spacy, from your plunge ppol you can look right on to the beach with a real stunning view. The breakfast buffet is great, the staff is very friendly. Overall we can fully recommend this hotel but prices are on highest side.